Turfstone offers specific and distinct advantages for controlling erosion and stabilizing slopes, embankments, river and low flow channels, flood plains and the shorelines of inland rivers, dikes, creeks, lakes, ponds and reservoirs, where there is no extreme wave action. Turfstone can also be used to reinforce grassy areas subjected to wheeled traffic that would otherwise become so compacted as to inhibit the permeability of the soil that is necessary for the grass to survive. The Turfstone paving system is an ideal overflow parking facility for parks, historical sites, institutions, university and school campuses and golf courses. Because Turfstone enables the traffic to go where the grass grows, it is a suitable for emergency or maintenance vehicle access which must remain greenspace. 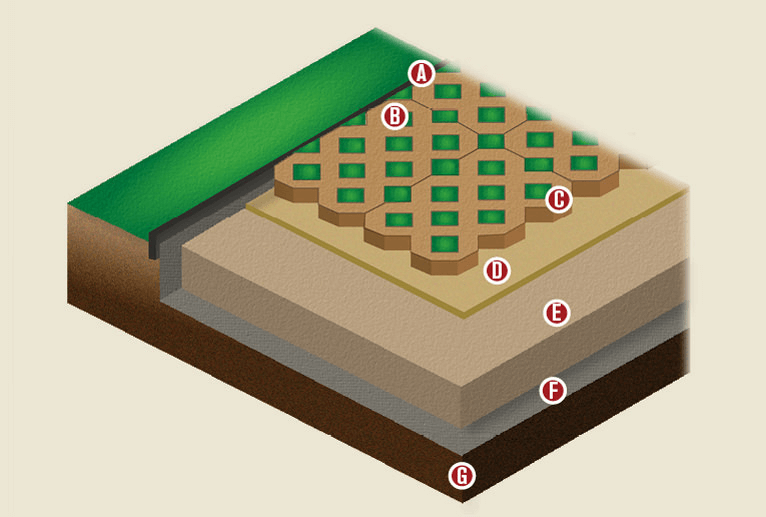 Compared to asphalt, grassed grid pavements can reduce surface air temperatures by 2° to 4° F (1° to 2° C) and radiometric temperatures by 4° to 6° F (2° to 4° C).